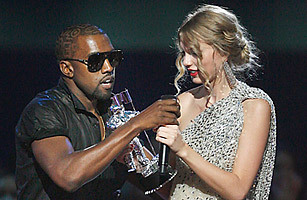 Kanye West takes the microphone from singer Taylor Swift as she accepts the "Best Female Video" award during the MTV Video Music Awards in New York on Sept. 13, 2009.
" It starts with this...I'm sorry Taylor"
Kanye West has been apologizing to Taylor Swift for his infamous microphone-grabbing moment at the 2009 MTV Video Music Awards for almost an entire year. Right after the award show, he apologized on his blog. Then he submitted himself to a public haranguing by Jay Leno. And then on Sep. 4 he released a rambling 72-Tweet statement about how awful he feels about the incident. "With the help of strong will, a lack of impathy, a lil alcohol and extremely distasteful & bad timing ... I became George Bush over night," Kanye began. "How deep is the scar... I bled hard.. cancelled tour with the number one pop star in the world ... closed the doors of my clothing office.... Had to let employees go... for the first time I felt the impact of my brash actions ... I felt the recession from an ownership side... People booed when I would go to concerts and the performer mentioned my name... Remember in Anchorman when Ron Burgundy cursed on air and the entire city turned on him? But this wasn't a joke. This was & is my real life." And that was just the beginning. Kanye went on and on and on, but ended with a simple three-word apology worthy of forgiveness. On Twitter, Taylor Swift has yet to reply.